It’s the ideal outdoor space – Wouldn’t it be nice to host family dinners and gatherings with friends in a space that’s actually comfortable? That dream becomes a reality thanks to a deck. Say goodbye to getting claustrophobic when everyone tries to squeeze into the living room. A deck gives you and your guests the chance to bask in the outdoors while still enjoying quality time together. It won’t be long before you’re hosting barbecues and other fun events! It increases the value of your home – Prospective homebuyers want to see a family-oriented outdoor space. 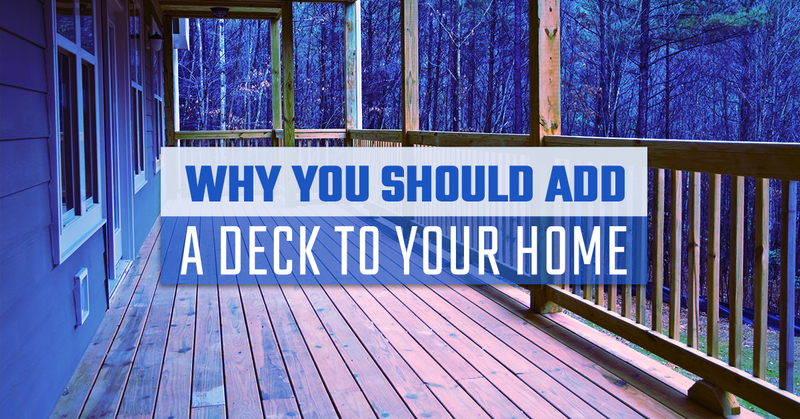 If you’re looking to sell your house anytime soon, it certainly won’t hurt to add a deck. Such an addition could be the one thing that separates your listing apart from another in the neighborhood. In can be built quickly – It could be that you’re looking to add space to your home as quickly as possible. Just know that many additions often take months to complete. A deck, on the other hand, can be finished in as little as one day. At Ready Decks, our patent-pending tools, equipment, and construction process allow our local deck builder to complete the majority of projects in just a few hours. Best of all, there’s no need to worry about damaging your home during the building stage. It provides extra space – Take a look at your backyard at the moment. We’re willing to bet that a grill, furniture, potted plants, and toys take up a good amount of the space. When you have a deck, though, your yard becomes freed up for other uses. Some homeowners go so far as to use part of their deck for storage. It’s an affordable investment – A functional, attractive home addition doesn’t have to cost an arm and a leg. Our deck installer uses only the best materials, such as premium-grade, treated lumber. Not only that, but our deck contractor uses ACQ-approved ring-shank fasteners that are designed specifically for speed, durability, and strength. Combine all this with the fact that Ready Decks products look better and last longer than just about everything else on the market today. No other company builds more quality decks than Ready Decks. If you’re interested in a pre-priced, custom-fit deck that looks incredible, then be sure request a free quote. We are your one-stop shop for premade decks, prefab decks, and mobile home decks for sale. Get in touch with our local deck builder today.